The trend is clear: when voters are faced with a left-leaning party campaigning on centrist economic ideals, they will pick the real deal every time. Every. Single. Time. At its best, Mulcair's NDP can inspire. Bill C-51 is the best example, but its universal child-care policy and promise to abolish the senate also fall into this category. But there have been too many blunders. Mulcair's sudden love for balanced budgets not only affirms the faulty framework that inexplicably lauds Stephen Harper as a responsible steward of the economy, it cedes precious ground to Trudeau at the moment Canadians want an alternative to neoliberal pabulum. In 2013, then-B.C. NDP leader Adrian Dix was about to address a labour convention to kick off his election campaign. Dix enjoyed a 20-point lead in the polls over a floundering Christy Clark. The mood in the room was jubilant: after 10 years of B.C. Liberal austerity, the left was going to finally win. Then someone handed me a placard: "CHANGE FOR THE BETTER," it read. "ONE PRACTICAL STEP AT A TIME." Uh oh, I thought. We are in big trouble. Meanwhile, Christy Clark told her base that this was the most important election in a generation, that low taxes and resource extraction were the only ways to protect British Columbians. She oversaw one of the greatest comebacks -- and worst collapses -- in Canadian political history. I'm getting that feeling again. In fact, I've had it for a while. We've seen versions of this strategy play out -- and lose -- again and again since Dix's calamity. Nova Scotia's Darrell Dexter's failed to get re-elected despite running a fiscally moderate (i.e. austerity-lite) government. Ontario's Andrea Horwath tried to run on centre-right economic bonafides and got crushed by a left-leaning (in rhetoric, anyway) Kathleen Wynne, throwing away NDP influence in Queen's Park. And Olivia Chow squandered an early lead to John Tory in the Toronto mayoral race by waiting too late to release her vision of a Toronto that could appeal to voters' imaginations. Yes, all NDP candidates face a hostile, disingenuous press and opposing parties with more money and more influence. I don't want to minimize the stacked deck all social democratic politicians must play with. But the trend is clear: when voters are faced with a left-leaning party campaigning on centrist economic ideals, they will pick the real deal every time. Every. Single. Time. In February of this year, Thomas Mulcair's NDP took a courageous and at the time, unpopular position on Bill C-51, a dangerous and unprecedented piece of legislation that would shore up the powers of the Canadian security state. Justin Trudeau's Liberals responded predictably to anyone who sees the current dimensions of political discourse degraded to the point where it is impossible to talk like grown-ups: they denounced the bill and then promised to vote for it. Mulcair, however, was rewarded for his courage. Trudeau plummeted in the polls over what Canadians clearly saw as a cynical and craven piece of brinksmanship and the NDP soared back to their 2011 heights. And then, of course, something beyond remarkable happened: the NDP won in Alberta, kneecapping a 44-year-old Tory legacy with policies that targeted tar sands corporations and promises to restore funding to public services. After that, the NDP looked like they could win anywhere. Mulcair's well-positioned federal NDP catapulted to the lead they would hold for months. 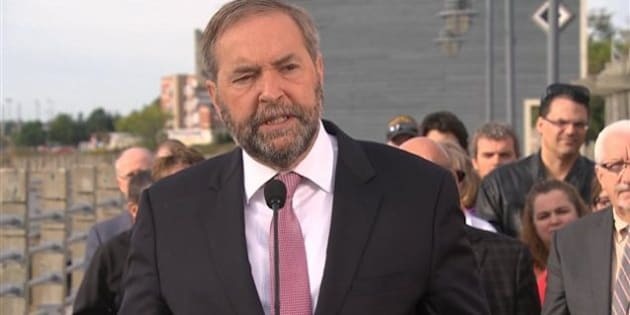 Since then, Mulcair has watched his lead chip away as a revitalized Trudeau fought back with traditional social democratic talking points like new infrastructure investment, higher taxes for the wealthy and, gasp, promises to run a deficit. Today, an EKOS poll (yes, just one poll, but still) puts Mulcair back in third place with Harper close to another majorty. Articles abound at how Mulcair's balanced budget talk, his turfing of pro-Palestinian candidates and equivocations over pipelines represents a betrayal to the party's leftist roots. Ok, maybe. Insofar as it is possible to still be betrayed by something that has been happening for decades. But the real take home from this rightward pose is that it is terrible strategy. At its best, Mulcair's NDP can inspire. Bill C-51 is the best example, but its universal child-care policy and promise to abolish the senate also fall into this category. But there have been too many blunders. Mulcair's sudden love for balanced budgets not only affirms the faulty framework that inexplicably lauds Stephen Harper as a responsible steward of the economy, it cedes precious ground to Trudeau, of all people, at the moment Canadians want an alternative to neoliberal pabulum. The Syrian refugee crisis represents another lost opportunity. When Canada's collective hearts were breaking and desperate for real action, party leaders debated how quickly or how carefully we should welcome the same 10,000 refugees. A bold, compassionate promise to take in something far closer to our fair share -- say, 100,000 -- would have set apart Mulcair and captured the rare moment emotion and politics came together in the imaginations of Canadians. Instead, our leaders tediously wrangled over how many angels could fit on the head of a pin. The reason Mulcair was elected Jack Layton's successor, we were told, was that he knew how to win. For four years, there has been little evidence of that skill until February -- when even that classic NDP archetype, the supporter who regrets they have but one membership card to burn for their party, felt fire in their throats. But if that appetite is not fed, history shows us it will find sustenance elsewhere. How many more times do we have to watch this movie? Because this time, I don't know if my heart can take it.